Would you like to visit the Grand Canyon from Las Vegas? Take a one day trip with us! We offer the best tours with the best value, guaranteed. Take a day trip on a luxury tour bus from Las Vegas to Boulder City, and you’ll be able to experience one of the greatest engineering wonders of all time, the Hoover Dam. Witness the stunning views and incredible architecture on this Vegas excursion with the Hoover Dam tour. There’s no better way to appreciate how a structure like this could ever be built than touring inside the dam itself. When you’re visiting Las Vegas, NV, you can do more than gamble in the casinos or see a show. Las Vegas is also just a short trip away from two famous American landmarks: the Grand Canyon and the Hoover Dam. So why not take a break from the nightlife and enjoy tours of the Grand Canyon and Hoover Dam during your Vegas trip? At Grand Vegas Tours, we can provide you with exciting Hoover Dam or Grand Canyon tours so that you can experience the natural beauty and history that Nevada has to offer. Whether you want to explore the Grand Canyon by bus or soar through this magnificent landmark by helicopter, we have the adventure to fit your needs and budget. We believe that your tour of the Grand Canyon doesn’t need to be pricey because everyone deserves to enjoy the beauty and wonder that this site has to offer. If a Grand Canyon tour doesn’t pique your interest, maybe the Hoover Dam will! 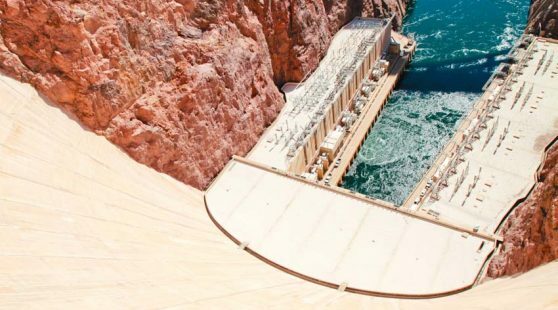 Take a look above at the details of our Hoover Dam motor tour, where you will be able to get up close to the amazing structure of the Hoover Dam. Are you ready to schedule your Grand Canyon or Hoover Dam excursion? Take a look above at the options we have available. If you have any more questions, don’t hesitate to contact us! We will be happy to discuss your options and help you plan a fantastic tour. Call us at 888-866-4135, or send us a message online to inquire further about the tours that we have available.